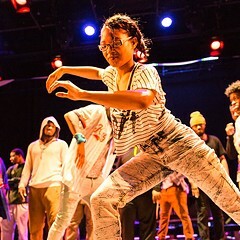 Dance is both a common form of bonding and a point of contention for black women. They are often the creators of new dance forms, but rarely see their labor reap anything other than derision. And in the traditional world of dance, most black women work against the mold. Consider New York-based choreographer Camille A. Brown. A recipient of multiple awards including a Bessie (the dance world’s Tony), she approaches dance as a method of provocative storytelling and confrontation. In her latest work, Black Girl: Linguistic Play, Brown examines the desires and difficulties of black women seeking to define their own identities. Ranging far beyond the “angry black woman,” Brown’s new piece frames nuanced depictions of black womanhood through the movements and methods of dance forms outside the classical tradition, from double-dutch jump rope to south-side steppin’ to tap and hand claps. Brown researched the piece extensively, but ultimately relied on her own experience from childhood on. “I had been living and fighting against those stereotypes for a long time, and [initially] I didn’t know if I wanted to have a process that goes even more into that,” she says. “I wanted to talk about the things that I knew that were a part of a womanhood, but also talk to them in a way that is universal.” At a time when black Americans (and women, and black American women especially) are demanding the world’s attention, the uncompromising Black Girl furthers the cultural conversation. For this, the troupe’s Chicago debut, it serves as the anchor of a program of mixed repertoire. Camille A. Brown & Dancers Fri 11/6-Sat 11/7, 7:30 PM, Dance Center of Columbia College, 1306 S. Michigan, 312-369-6600, columb.edu/dance_center, $30, $24 seniors.